Split large PST files manually by selected criteria. Split Outlook data by date. Separate data files by specified time periods. Split large PST files and deal with a huge amount of old data in your Microsoft Outlook. One of the ways PST Splitter can split large Outlook PST files is based on the item creation date. There are two options to split files by date. The first allows you to devide PST files by specified time interval: years, months, weeks and days. For example, create archives for each year of your work data. This way you will not have loads of data slowing down your Outlook and it will be easy to manage PST files and find items in archives, as long as you know what year you are looking for. For the second option, select a specific time range you want to split into separate data file. Move data that you do not use anymore to a new PST file and clean up Outlook this way. If you want to have your Outlook data on another computer, you do not need to load it with the full PST file. Select only the latest period that you need and copy it to a new PST file. Transfer only the relevant data and save the space. Copy or archive Outlook folders in separate PST files. Another way to devide PST files is to copy or archive Outlook folders into separate data files. The PST Splitter Pro Edition has an option to select the exact folders to be moved or copied to new PST files. Archive folders of old projects and organize Outlook by cleaning up the folders’ structures. PST Splitter is a really useful tool if you need to move or copy only particular parts of your data. Specified folders can be moved to a single PST file with or without subfolders. If you choose to keep subfolders, all the structure will remain the same in the new PST file. There is also an option to create separate files for each folder and subfolder you select. Let’s say you want to work on one project from home PC and data related to this project is stored in one Outlook folder on your PC at work. By using PST Splitter, you can create a new PST file where data only of this folder and its subfolders will be stored. Import the newly created data file in Outlook to your home PC and access the same unchanged data as you have at work. You can also open PST files with OST PST viewer tool, which helps you open, view and search in PST and OST files without Microsoft Outlook installed. 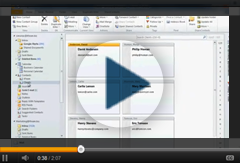 Separate Outlook accounts to different data files. 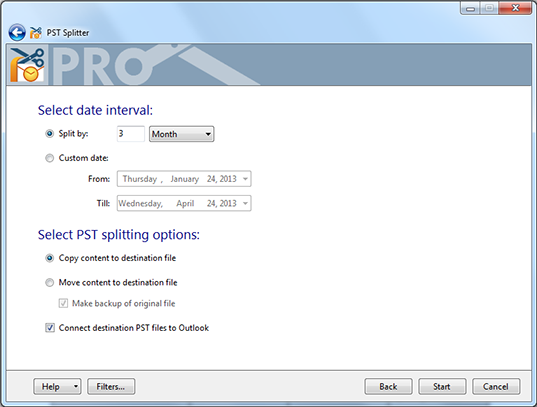 PST Splitter Pro enables you to split Microsoft Outlook data by accounts. In case the data of several accounts is stored in a single data file, you can easily separate Outlook accounts into different PST files using PST Splitter Pro. After splitting the data by accounts, the structure and data integrity will not be harmed or changed in any way. It is a safe and simple method to export Outlook accounts as separate files. The created PST files can be imported and used on any other computer with Outlook installed.